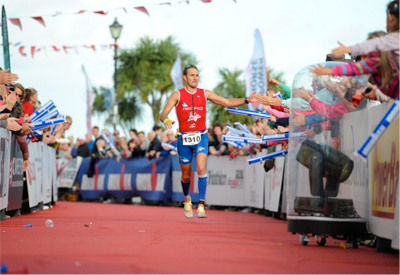 In 2011 I raced the inaugural Ironman Wales and was blown away less by the remnants of the hurricane that swept in from the Atlantic (making for epic conditions for both swim and bike) than the beauty of the course and enthusiasm of the local support. Even on a day when my performance was below par the race filled me with joy and I knew I’d be back. 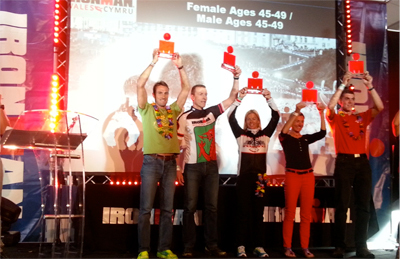 Having decided not to race Kona this year, Ironman Wales took its place as my “A” race, with the main goal being to avoid the mistakes I made on the bike course two years ago and set myself up for a good run. I was also hoping to bag an early slot for Kona 2014 and, although I’d only told a few people beforehand, I had a sneaky feeling I might be in with a chance of a first Ironman age group win (after two 2nds, a 3rd and a 4th in the last few years). Training couldn’t have gone better through July and August, though my bike strength was a bit of an unknown due to the effects of a 9 hour coast run in June that had really hammered my legs. 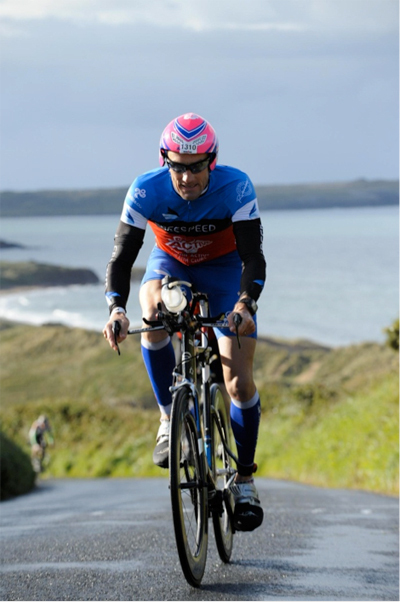 2012 had been a much faster year than 2011 in Tenby, partly down to a shortened run course, but also on the bike. Looking at the 2012 times, I thought around 10 hours would be needed to be sure of Hawaii qualification and something closer to 9:45/9:50 for the win (depending on conditions and the length of the run). The forecast for race day was for typical Welsh conditions – four seasons in one day … twice, was what we were told to expect at the briefing and race day did not disappoint (though I’m not sure I remember Summer featuring as one of those seasons). I barely slept the night before the race, but didn’t let that bother me as it really has no impact once the race adrenaline kicks in. Lining up for the swim I felt calm and confident in my training and was looking forward to the day ahead. The sea was relatively flat and I was hoping for a PB after clocking some good times at Shepperton Lake in the preceding month. 55 minutes was the number in my head. So seeing just under 59 minutes on my watch as I exited the sea I was slightly disappointed, but didn’t let it phase me (it turns out all the times were slow this year, with even the lead professionals 2-3 minutes slower than last year) and set off up the steep cliff path for the 1km run to T1 (a fantastic extra feature of this race as you get to run through the crowds in town before heading out on the bike). Onto the bike and even with arm warmers, bike top and neoprene toe covers I was still very cold initially, but I was sure the first hill would sort that out. I spent a bit of time trying to get my heart rate monitor working, but once I’d given up on that I settled into the task, using power and perceived exertion as my guide and ignoring others who went piling past me up every hill in the first hour or so. The effort some of them were obviously putting in amazed me and I was confident that most of them would run out of steam – this is a long, hard bike course with a real kick in its tail, so a measured effort really pays off. The exception was Magnus Backstedt (Paris-Roubaix winner in 2004), who flew past about an hour into the bike leg and wasn’t to be seen again until well into the run. The bike section had a bit of everything – very occasional warm sunshine, showers, downpours, hills, more hills, spectacular views, a few more downpours and then some more hills. I probably had my most controlled ironman ride ever and never felt under any strain, resisting the urge to hammer up the climbs out of Wiseman’s Bridge and Saundersfoot despite the incredible crowd support (think Tour de France mountain stages, only with Welsh accents). I dropped my chain a couple of times, which cost me maybe a minute, but otherwise the ride was incident free, though made harder by the wet conditions which stopped you carrying any speed from the descents into the next uphill section. Without any heart rate feedback I was worried I might have taken it too easy (and maybe I did), but when I got to T2 with just under 7 hours race time elapsed the bike racks looked fairly empty and I was confident that I was in good shape for the run. I’d managed to stick with my nutrition plan on the bike without overloading my stomach (the problem in 2011) and never really allowed my power to spike too high or for too long. It took longer than I would have liked to get my freezing toes into my Fivengers SeeYa’s but once I was out of transition I knew immediately that my run legs were with me (a big relief after a series of disappointing runs in my last three or four ironman races). I set off just behind the third placed lady and she was my first target, ticked off after about 1km (which was completed in the slightly worrying time of 3:45 – too fast even if I was feeling good). That was probably the only flat km of the run though and the hills soon forced me down to a more sustainable pace. At this point I had no idea of my position overall or in my age group. I had assumed that if I could be anywhere near Lucy Gossage (a phenomenally talented pro female) I would be doing well. However, Lucy passed me coming the other way after only about 2km and I estimated that she must be 20 minutes ahead. Not disastrous (I knew she would love the hilly bike course), but more of a gap than I’d hoped. Coming up to the first turnaround point, about 3.5km out of town I spotted one athlete in my age group about 2mins30 ahead. Next target …. At the next turnaround, only ~1.5km further on, I’d closed the gap by about 15 seconds and by the time I ran back into Tenby for the end of the first of four run laps I thought that he couldn’t be much more than a minute ahead. In town Lindsay shouted to me that I was in 2nd – this news nearly blew my mind. I knew I was going to make the catch quite soon and I now knew that would put me in the lead (as long as no one was gaining on me from behind). This was getting exciting. I completed the first lap in 47:00, 3:08 marathon pace, but I knew that the pace would likely drop in the second half. The distance seemed to be correct on my Garmin (possibly a fraction long even), so I set my sights on holding sub-3:10 pace for as long as possible, which I thought would be a really good time on such a hilly course. Heading out of town again, I spotted my target moving slowly on a steep incline and and resolved to pass him as decisively as I could. Making the pass about 11.5k into the run I was into unknown territory with nearly 20 miles of running ahead. I’d never been in the lead before and I really wasn’t sure how to play it: press on and build as much of a lead as possible or conserve energy and play safe? I was still feeling good, so decided that the best thing was to press on and just see how much of a gap I could open up, keeping an eye out for anyone in my age group at the turnarounds. My lead extended rapidly through the second lap (completed in 38:00, so on for 3:10 overall, but slowing) and by the first turnaround of lap three there was no sign of anyone in my age group – this meant I had a lead of at least 5 minutes. At this point I caught up with one of the pros (Markus Thomschke). He was in fact a lap ahead of me on his final lap, so it wasn’t really a catch, but I was running faster than him at that stage at least! As I passed him he picked up his pace and stuck on my shoulder. 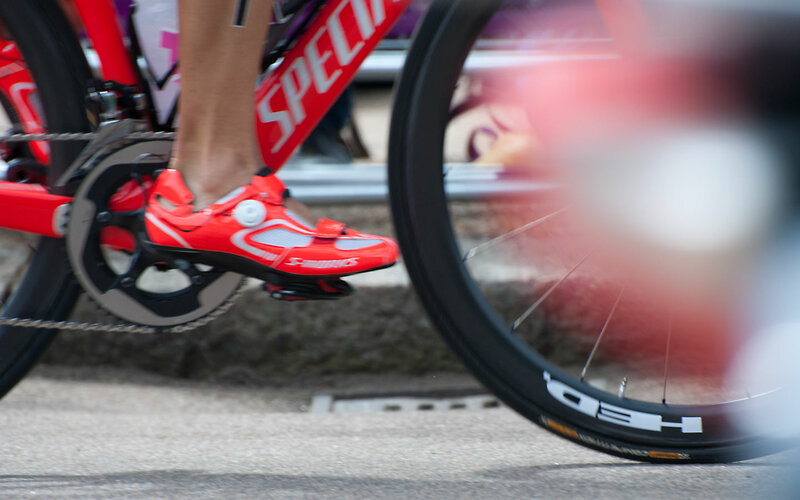 I asked him where he was placed (4th) and the gap to the next pro (too much for him to catch he thought) and then found myself unconsciously pushing the pace on, taking strength from the sound of the two of us running in synch and passing slower athletes. Although I was feeling great, after about 3 or 4 km of this (~30km into the run) I decided it was time to back off a little to make sure I didn’t blow myself up in the final 12km. Markus thanked me for the pacing and headed for the finish while I set off on my final lap. It was hard not to start counting my chickens at this point, but in an ironman you never know what the last 10km will bring, so I didn’t allow myself to get excited yet. When I still couldn’t see anyone in my age group at the first turnaround however, I knew that with a lead of at least 5 minutes and only 6kms to go it would take some special running or a spectacular implosion for anyone to pass me. At the final turnaround by North Beach (where the day had started 10 hours earlier) I decided it was time to push for home through the final 2.5/3km. I pinned back my ears and went as hard as I could through the twisty turny streets of Tenby, overtaking the 2nd placed woman (last year’s winner) in the process. As I exited the arch in the old town walls for the fourth time and with my full complement of coloured armbands, I was able at last to turn left towards the finish chute (rather than right, back out on the course). Hitting the seafront with about 200m to go I could see the long red carpet ahead and it was time to really enjoy myself. A final glance back to make sure there was no one behind me and then with the sun shining, beautiful coastal views to the left and crowds thronging the barriers, I soaked up the atmosphere as I closed on the finish line high fiving madly with all and sundry. Across the line and all that pent-up emotion I’d been suppressing for 20 miles since taking the lead came flooding out – I’m afraid I blubbed like a good’un. Luckily Lindsay’s an old hand at this and was unphased by finding her husband sobbing uncontrollably in the finish area. My marathon time in the end was a smidge over 3:16, slower than I had expected at the start, but a really solid run on that course (6th fastest age group run). I’d have been interested to see if I could have run faster if under pressure in the second half, but hopefully I’ll have a chance to answer that question in Hawaii next year. 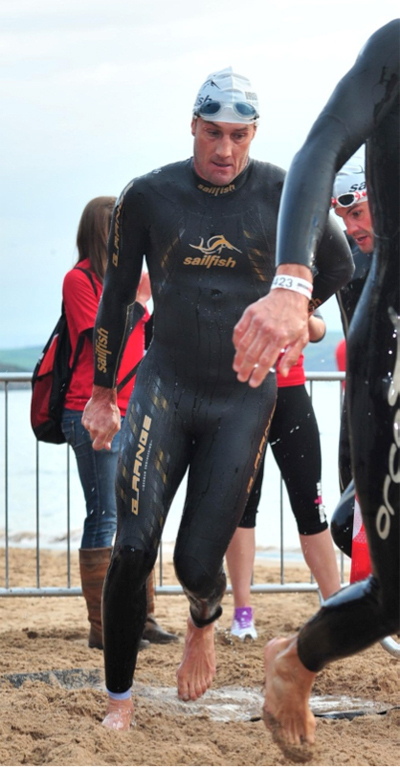 Tenby and Pembrokeshire delivered again and this time I had managed to race well too. What a fantastic event and amazing day. I’ll be back. Arguably my best result to date. Ecstatic! Next stop Kona, October 2014. Lots of time for James and I to work out a plan to get on the podium at the Big Dance.